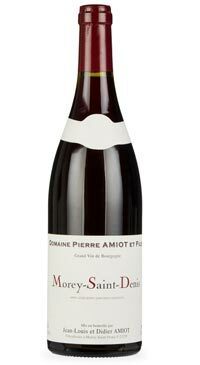 Domaine Pierre Amiot was established in Morey-Saint-Denis 5 generations ago. Today, brothers Jean-Louis and Didier cultivate 8 hectares of vineyards in Morey-Saint-Denis and Gevrey-Chambertin. The domaine is spread around the original estate, which is located in the town center. There are now 40 parcels of vineyards, with 85% in Morey-Saint-Denis and 15% in Gevrey-Chambertin. Jean-Louis and Didier are proud to present a complete range of wines from every appellation level: 2 Bourgognes, 3 Villages, 5 Premiers Crus and 2 Grands Crus. raspberries. Good balance of red fruit, acidity and tannins. An elegant and generous wine, with bright fruit on the finish, and good length.